A couple of days ago, the forecast was for strong thunder storms and possible tornados in the afternoon. The valley where we live is the perfect runway for wind storms. Tornados are a rarity here, but small ones have been known to form. When we first heard about the possible heavy storms, it seemed a little odd since it was a beautiful summer day. The skies were blue with a few puffy clouds scattered about. Then the clouds began to mass together and build in height. At first it was rather pretty. But as we watched the cumulonimbus clouds build to well over 30,000 feet, we started to get a little apprehensive. And wonder which corner of the basement would be the safest. Luckily, it never did rain or do much of anything else. The menacing skies moved eastward and out of our view. 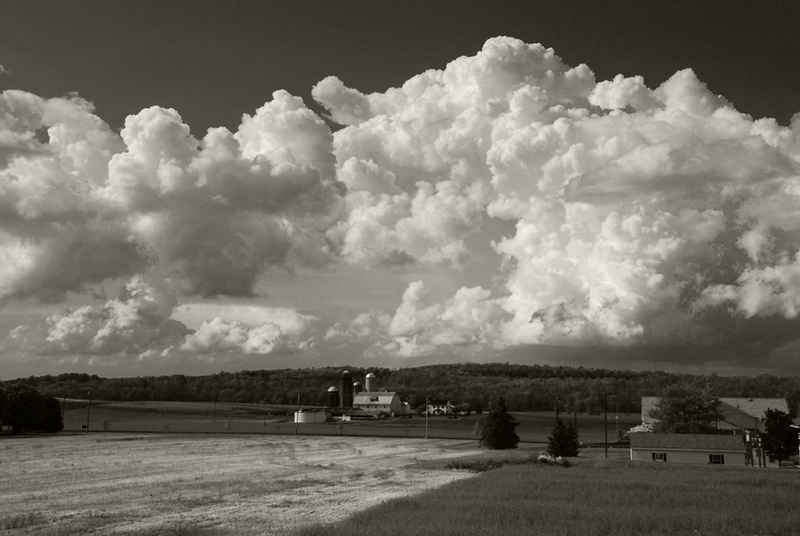 But for a while there, it sure looked like the unfriendly clouds were going to swallow up the countryside.